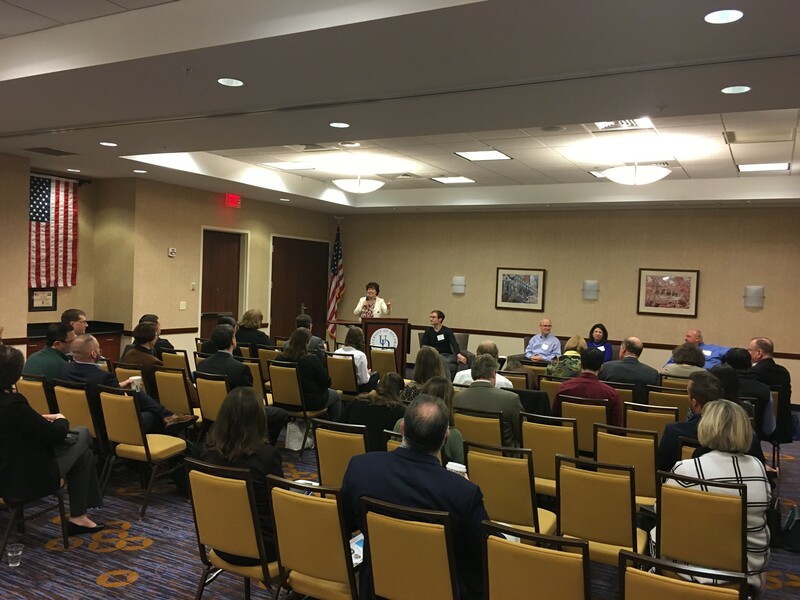 A panel of sustainability leaders met last Thursday, February 7, at the Courtyard by Marriot Newark-University of Delawware to discuss why sustainability is good for business at our first Cutting Edge event for 2019. The discussion was moderated by Dr. Bryan Tracy, CEO and Co-Founder of White Dog Labs, and panelists included Melanie George Smith, Founder and CEO of Sustainable World Strategies, Bob Buck, Ph.D. and Technical Fellow of Chemours, and Greg Smith, Sales Director of Industrial Chemicals for Croda. Each tapped into how sustainable innovations are currently changing the way we live our everyday lives and what the future holds as it rapidly evolves throughout multiple industries. Each panelist spoke about their organization’s sustainability focus, including Croda’s humble beginnings in lanolin and sorbitol to today’s multi-national organization that produces sustainable chemicals that are contained in products we use every single day and a sustainable manufacturing facility right here in Delaware that produces 100% non-ionic surfactants from plant-based products (vs petrochemicals) – the first supplier in the world to do this. Ms Smith then opened the discussion with a broad overview of sustainability and the three pillars that are used as a corporate sustainability benchmark: environmental, social and governance (or ESG*). The environmental pillar considers how a company performs as a steward of nature; the social pillar examines how a company manages relationships with its employees, suppliers, customers and the communities within which it operates. Governance deals with a company’s leadership, executive pay, audits, internal controls and shareholder/stakeholder rights. More and more, companies are adopting this benchmark, with major brands like Patagonia adopting this practice because they know consumers are becoming more conscious as to who and where they buy their products from. Consumers are increasingly aware of corporate choices and would prefer not to support a large label brand that openly makes negative social and environmental choices. All panelist agreed that much of the push for sustainable innovations is increasingly being driven by millennials and Generation Y. As consumers, they are making more conscious decisions regarding the food they eat, clothes they wear, and products they use are free of chemicals harmful to their health and the environment. Another topic of discussion was corporate investment in innovation. While consumers are often driving the needs for investment, there is often a disconnect between what a traditional 2-3 year, and the longer returns that sustainable innovation yields, as well as the intangible returns such as customer retention and core customer growth. Nevertheless, an increasing number of Fortune 500 companies have already committed to sustainability and the panelists offered suggestions and starting points for any organization seeking to implement a Sustainable strategy, including following Green Chemistry Twelve Principles** and “The B-Corp Handbook-How to Use Business as a Force for Good” by Ryan Honeyman”*** which came highly recommend by Bob Buck. The book explains that using business as a force for good can help distinguish your company in a crowded market, attract and retain the best employees, and increase customer trust. The final topic and a consistent theme throughout our Cutting Edge conversations was talent. Both Chemours and Croda make a concerted effort to connect with students at multiple levels, but all panelists reinforced the need for project-based STEM learning to be introduced earlier in schools with more application and innovation based learning at the higher levels. The NCC Chamber of Commerce would like to extend its thanks to the panelists and for their insightful and impactful discussion and look forward to continuing this important discussion and showcasing Delaware’s leaders in this area.